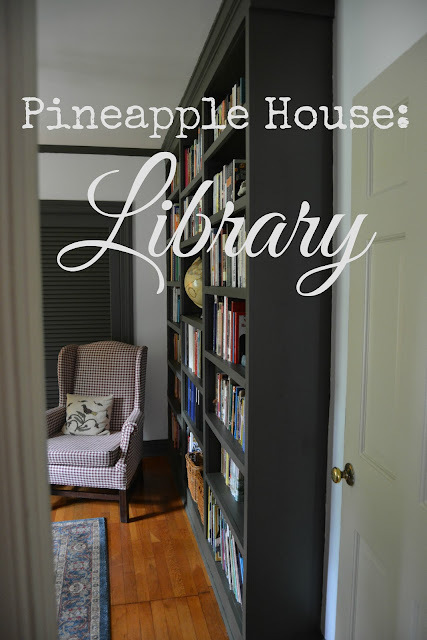 A few months ago, I told you about our plans to turn our fourth bedroom into a library. I am over the moon about what we accomplished in this room! I am thrilled that all of my books are now unpacked. I am happy that I no longer need to keep the door of this room closed. I am delighted that we have a cozy little library/office/school room/sitting room. And . . . we did it on the cheap! Really, we spent comparatively little money making over this room. We used our DIY skills, we shopped the house, and we found a few bargains to create a library did not break the budget. 1) Floor-to-ceiling bookshelves on one wall. We did it! Or rather . . . Ron did it! We decided on staggered levels for the shelves, adding visual interest and also providing a few taller spaces for oversized books and/or collectibles. Floor-to-ceiling maximized the space. There's room for everything and even a bit of room to expand our collection. There are shelves for geography, world history, American history, science, biographies, children's fiction, adult fiction, picture books, and homeschool resources. I was even able to devote a shelf to my 26 years worth of homeschool record books. One of the larger shelves has oversized books and two baskets, one for board books and one for baby toys. (I love it that the toddlers go directly to these baskets and come out with books to read.) Ron added a few outlets, but, of course, I ended up putting the pencil sharpener on a shelf that didn't have an outlet, so we're going to have to drill a hole in order to reroute the offending cord. This photo has a wonky angle because I took it from outside the window! On this shelf, I have some favorites: our globe, my beloved Genevieve Foster collection, reference books, an olive wood camel my mom brought from Israel many years ago, and my Great-Aunt Minerva's school bell. I love having a home for my globe. As a homeschooling family, we have always needed our globe to be accessible, but its home in The Farmhouse was a corner. This is better. We definitely shopped the house for this space! This wall cabinet was the one that Ron built for The Farmhouse bathroom. We hung it in the dining room here at Pineapple House, but it felt off. (Having nothing under the cabinet made it feel like it was floating.) Now, however, it has a home. This is right. It hangs over the desk and holds envelopes, cards, and other stationery. Ron is using the desk for household finances. I write out cards and notes here. Occasionally Bekah does her school work at the desk. And the mail . . . well, it gets to the tray some of the time. We're still working on that. This love seat was used hard in The Farmhouse kitchen, because that room was the hub of our home. It was the kitchen, the sitting room, the school room, the gathering room, the party room. The love seat has had a lot of use. We're not ready to have it reupholstered yet, but it needed an update. I found a very inexpensive throw on eBay, so I am using it to cover the back of the love seat. It certainly buys us some time. The love seat is the most comfortable piece of furniture ever! I find myself here a lot . . . having my devotions and morning coffee, blogging, and, yes, even reading! We picked up this Warren Kimble print for $25 at an antique shop! Score! 4) An overflow conversation area. As I told you in this post, I was hoping to find a wing chair to expand the function of this space to include a small gathering/sitting room. I searched Craigslist for months, but I couldn't find exactly what I was looking for (the perfect combination of style, price, and location). I began to wonder if a wing chair would even work in the room at all. Maybe a chair would crowd the small space. Right after we finished painting, Kati suggested that we bring in the red-checked chair from the living room, just to see if it would work. Well, not only did we decide that a wing chair would work, we decided that we wanted this wing chair! Right size, right color, just enough pattern . . . no need for Craigslist! Shopping the house can be a good thing. Of course, to make a sitting area, you need to have a rug. 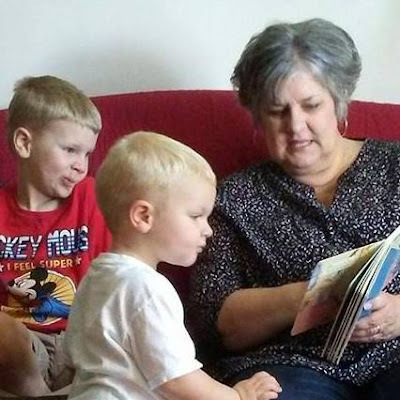 And how are those little grands going to sit and play a game or do a puzzle if they don't have a cushy place to land? Wanting to keep the cost down, I began my search locally. What do you know? I found my rug in Walmart. It is Venetian Scrollwork in their Better Homes and Gardens line. And it was $78, folks! Score again! It is not the quality of my living room and dining room rugs, but this is a low traffic area and I am happy with how it looks, so it is good. Now to give you a few more details . . .
For the walls, we used the same antique white that we have used in all of the other rooms at Pineapple House. I am sorry that I can't give you the exact color, but it was an old Valspar color that Lowe's no longer carries, and we have had it color matched from an old can. It is my favorite shade of white -- not too white, but not yellowy or tan. I had planned to use a check to make a fishtail swag. But after deciding to keep the checked wing chair in the room, and considering the coverlet pattern on the love seat and the design in the rug, a check seemed like too much. Kati and I went to Hobby Lobby and we found a simple fabric that looks like linen (it isn't) that seemed just right. We wanted updated lighting for the library. I found this small bronze chandelier at Sturbridge Yankee Workshop. Not only was it the right size for the space, it was also the right price! It was on sale and I had a discount code. We paid just a smidge over a hundred dollars for this new light. So there you have it: our library/office/sitting room! Yes, I am over the moon, because it turned out even better than I had imagined! It may not be on the cutting edge of home decor. But it is functional and cozy and it fits our style, and that makes it perfect for us! It is delightful! All that wonderful space for books! What a great job you did shopping the house! Are there places needing to be filled in other rooms now that you've done that? I'll share about that in a later post. I kissed cutting edge goodbye a l-o-n-g time ago! Cheryl, this is comfort and class combined beautifully! This room is so YOU! I love it! When I visit we must sit in this room at least part of the time! Congratulations on this dream coming true! Tell Ron we think he did an amazing job! Thank you, friend! We will definitely do some hanging out in the library! And, yes, I'll be sure to tell Ron! This reading-room has a meditative restful appearance - quite inviting. 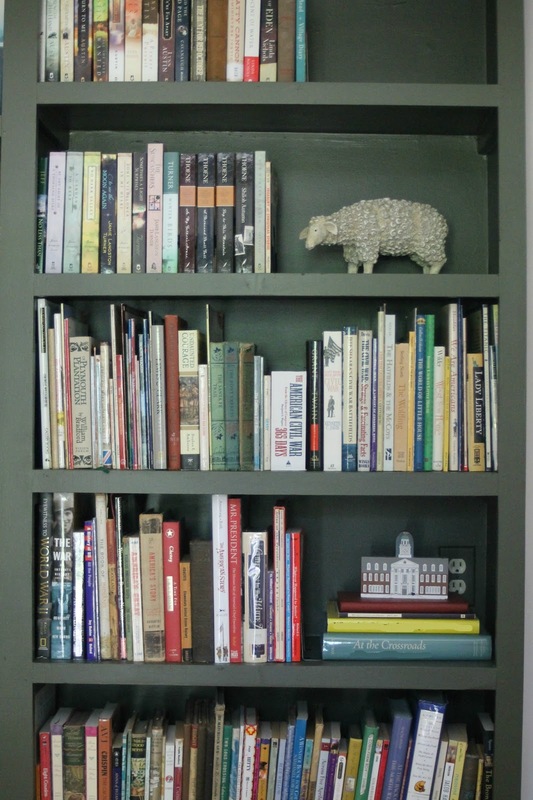 The check wing chair stands out softly against the green bookshelves. I like how your husband staggered the shelves for interest. I have a school bell, too. I used to ring it when supper was ready. Well done. Thank you for your comments, Karen! Hmmmm . . . I have never used the bell to call for supper, but I may give that a try. Love everything about this room! Great job setting it up and decorating - looks so relaxing. Thanks, Martha Ellen! I am found in the library often these days myself. Is it because it is a new room, or is it because I feel so at home here? I think it's a combination of both! I'll pass along your words to Ron. Nicely done! I love the look and the feel of this wonderful room. Thank you, Lorraine! Happy summer to you too! Thank you, Judy! It is hard to imagine a home without books! You got my attention with the word library, as I am a retired librarian. Your paint colors are very restful, I like the green, and all the pieces you found while shopping your house. Now the globe has a convenient resting place. Well done. Thank you, Terra, fellow book lover, for taking a tour of our library and leaving your kind comments! I love every part of it. That is a great idea to have outlets on some of the shelves. I'm keeping that idea in my head to pass on to Dear. Love that old school bell from your great aunt! That love seat looks real comfy. You did well shopping and repurposing to keep the costs down. I would never guess that rug came from Wal-Mart! Hope your weekend is going well. Well done! There's something so wonderful about a room coming together just perfectly for your needs. It does look so cozy and comfortable, with just the right style. Thank you, Miss Dishywoo! We are all so thrilled with our new room. Thanks for stopping by! I agree...who needs cutting edge? Not me. I love your room, Cheryl, and I think it's definitely magazine-worthy. And I'm envious of your book shelves. Ron did such a nice job. I have an old school bell that came from the one-room school I attended. Yours is perfect displayed in this room. Have a nice week! I meant to add Thanks for the link for hiding tv cords! You are quite welcome! Hope it helps! I absolutely love posts like this, and I LOVE what you did with this room! It's wonderful and cozy and warm. OH, and your soo right. We "shop" our house ALL THE TIME, lol. We spent an hour or so yesterday re-arranging our living room, and I am sitting here this morning loving how it came out. Not a new thing in it (well except the carpeting) but it has a fresh new feel. I LOVE LOVE the shutter Ron did for the window. And the bookcase he made is soo good too. I'd love it if someone over here had that talent. ENJOY that new room...I know you will! Yes, changing things up a bit makes everything feel fresh! I just love it! I love everything about it! Lovely, lovely space! Coincidentally, we are working on a very similar space in our basement... in progress, with baseboards and trim being painted today. With a full wall of bookshelves, and an older wing chair with a red and white plaid fabric. A reading library of sorts. What a coincidence! Thank you! Wow! It sounds like our spaces are quite similar! I hope that you'll share some photos. Off to check out your blog . . .
You know I thought I commented on this but I guess i didn't. It looks perfect. I love it all--you guys did a great job and I know it was done with great thought and care all the way. The red checked chair looks perfect there. I love the globe of course, all the books, and even the outlet. You may want to put a small candle type lamp on a shelf some day. My sister has one and it looks cozy! No worries about commenting . . . but thanks for your encouraging words! A lamp is exactly what Ron was kept saying when he put in the outlets. And then I took up that shelf with the globe, etc. and then put the pencil sharpener on one of the shelves without an outlet! But I may eventually put a light. I'll bet it does look cozy! Just now taking time to see your pictures again, such a lovely room that you all have helped to create. What a great idea of staggering the bookshelves, your husband did a great job! Thank you for sharing. Thanks, Melissa . . . and I'll pass your comment along to Ron! I am so sad that I didn't poke my head in an see this room while we were there. What a cozy space. I love it. And it has given me some good ideas for our library/school room.